Mesut Özil has announced his retirement from international football with immediate effect, the midfielder hitting out at what he perceived to be unfair discrimination surrounding his meeting with the Turkish president, Recep Tayyip Erdoğan, in May. Özil was a member of the Germany squad that went out of the World Cup finals in Russia at the group stage and was the target of criticism for his performances as well as his meeting with Erdoğan, who has been accused of human rights abuses. The Arsenal midfielder has Turkish ancestry and defended his actions in a lengthy statement and one in which he launched a scathing attack on the German football federation (DFB). “For me, having a picture with President Erdoğan wasn’t about politics or elections, it was about me respecting the highest office of my family’s country,” Özil wrote on Twitter. 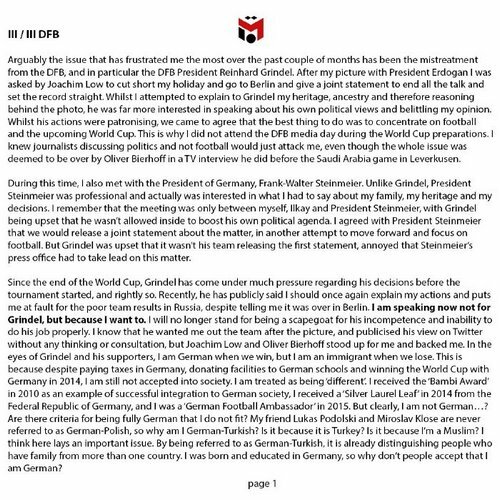 Making direct reference to Reinhard Grindel, president of the DFB, Özil added: “People with racially discriminative backgrounds should not be allowed to work in the largest football federation in the world that has players from dual‑heritage families. Attitudes like theirs simply do not reflect the players they supposedly represent. In the eyes of Grindel and his supporters, I am German when we win but I am an immigrant when we lose. In a three-part statement posted on Sunday evening, Özil was scathing in his criticism of Grindel. “I will no longer stand for being a scapegoat for his incompetence and inability to do his job properly,” Özil wrote. Sign up for The Recap, our weekly roundup of sport features. The 29-year-old added that he had received abuse online, and claimed he was racially abused by a supporter after the match against Sweden.